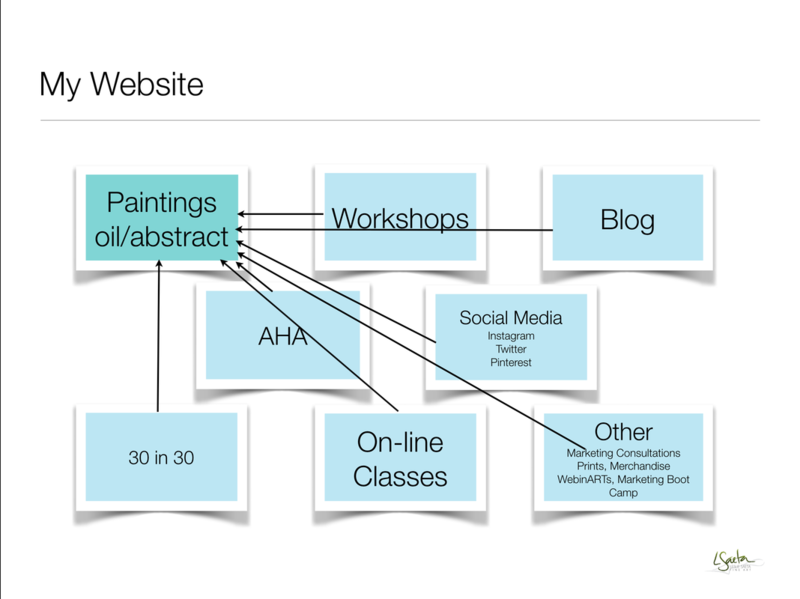 Every art website should be simple, easy to navigate and organized. I have seen hundreds of art websites that were almost impossible to navigate. I've seen many art websites where it's impossible to buy a single painting on the site. I have also looked on an artist's website for an email address to contact the artist to inquire about their art ... and never found it. Please don't make these mistakes and be sure to include all of the basics in your website. Home Page- the welcome or "home page" should be colorful, show off some of your art and give the visitor a reason to stay. It needs to include: the name of your art business, your email, a link to sign up for your newsletter and contact information. Paintings- any name for this page is fine as long as the visitor understands this is where you go to see the art. Every painting should feature a great photo, specifics (medium, size, etc. ), price and an easy to follow process to buy the art. About the Artist - every site needs information about the artist. Here you should include photos and a bio. Other pages: Workshops (if you teach), Events (upcoming shows), Demos (videos), Galleries (if your art is sold there) and any other interesting items that highlight you and your art. I have pages highlighting all of the products I sell: my art, webinARTs, art merchandise, workshops, Marketing Consultations, Prints, etc. Before we start creating our website, I am going to show you how the weebly site works. ​Watch this video as I explain how to navigate weebly. It's almost time to start building your website. But first there is an important step that everyone needs to do if you already have a weebly art website. The new weebly4 uses new templates that are more mobile friendly and allow you to use the new sections and headers. So it is time to update your theme. ​Watch this video and I will show you how to update your theme. If you are just starting with weebly then you can skip this video. Let's get started with our new website. ​Watch this video as we create the site, select a theme and build a home page.